Because of you. With you. For you. We are changing the way we fund raise. Because of you. With you. For you. 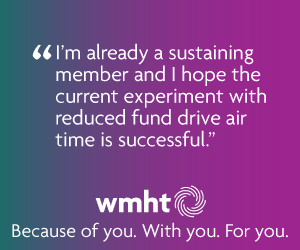 With your feedback, WMHT is changing the way we fundraise on television. No more weeks long pledge campaigns pre-empting the programs you enjoy the most. As of November 2018, we are no longer running weeks long pledge drives on television. You read that correctly! While many public television stations across the country will be running pledge programs, we will be airing the programs you love and love to support. We can only make this change with you. We still need your support to bring you the best in educational, public affairs, and arts programming. That's why every Thursday night and Saturday and Sunday afternoons, we will be airing programs that encourage your support and include fantastic ticket offers to local venues or other special thank you gifts. Want to pledge your support now? We welcome you to do so with a One-Time Gift or Ongoing Monthly Contribution. We continue to change the way we fundraise.